You might think “If it isn’t broken don’t fix it” so why should I upgrade my commercial security system, right? Your current security system is working fine it records data okay, the power usage is acceptable, upgrading your cameras simply isn’t the place you should invest your capital, right? Well, not really. The rapid advances in security camera technology over the last few years present some good reasons to upgrade your system. The quality of analogue camera footage is limited by the camera model and the analogue signal IP cameras however use HD technology that will give you a much sharper source image. The better the quality of the footage you capture the more details you will be able to see. If there is ever an incident that you need to investigate the higher definition of your original image will allow you to further enhance and enlarge the images so you won’t miss any detail. Storing traditional analogue footage is hard and require outdated equipment. Also, storage is usually limited to the amount of days you buy upfront. Modern IP based systems however offer many flexible and cost affective storage solutions that will allow you to store footage for a much longer period. The footage is digitized so you can store it on hard drives or web servers. Some automatic backup features will even archive your footage do that it’s available for retrieval at a later date. Analogue camera systems require a special cable for every camera you install as well as a separate cable for power so adding another camera is inconvenient and cumbersome. IP systems however use a single standard network cable and can be installed using your existing high bandwidth network. Adding new cameras is quick and easy. Any disruptions to your work environment will be minimal. IP camera systems were created with the user in mind. They have many advanced features like zoom in and spanning that will likely give you better coverage and less blind spots then you currently have. You will also get remote access. 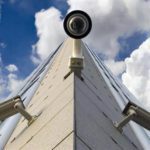 IP cameras are part of a network that can be connected to the internet, so you can access your camera feed using your phone, computer or tablet from anywhere and at any time. At the rate the world is changing it is practically impossible to stay ahead of all the trends, but you know what’s best for your business and with all the advantages that ip systems have over the old analogue ones in footage quality, storage and advanced features upgrading might be the right thing for you and your commercial security system .